How I came to know this was pure serendipity. 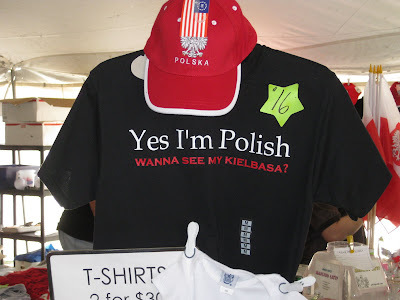 We were driving to Sleeping Bear Dunes National Lakeshore, which spans 35 miles of Lake Michigan coastline, when we saw a banner stretched across the road that said “Annual Polka Festival – July 2-5th.” As it was the 5th, there was only one thing to do. “Pull over!” I yelled. 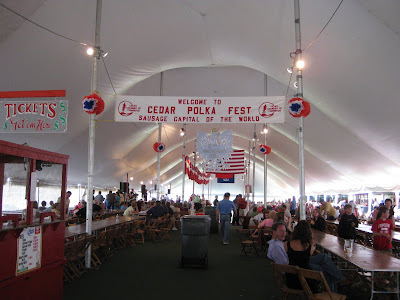 Soon, we were handing over $5 to enter a big tent in the middle of town. 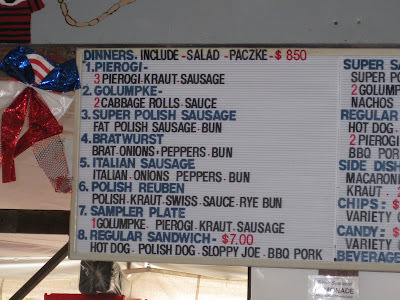 What we found was this: a live polka band (called “PMS”), old folks dancing, lots of red and white outfits (the colors of Poland, where many area families hail from), long tables dotted with pitchers of beer, a “Polish Pride” souvenir booth, and, of course, sausages galore. 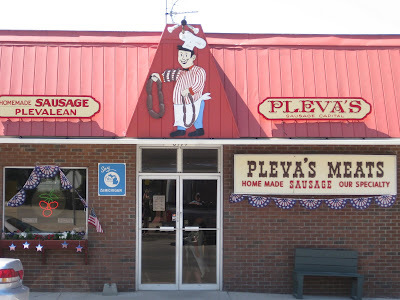 You see, Cedar is home to the famed Pleva’s Meats, known for premium sausages as well as the “Plevalean” burger. What makes it special is the addition of a little something extra. It’s – wait for it – cherries. Of course. Founder Ray Pleva got the idea from his daughter Cindy, the 1987 National Cherry Queen, who wanted to help the struggling cherry industry. Today Pleva’s supplies “cherry burgers” for school lunches in 17 different states (!) and sells over 40 “cherry-enhanced” products, including the popular Cherry Pecan Sausage. I’ll admit, however, that I didn’t care for the latter. I tried a sample, and it was a bit too nutty/gamey for me. 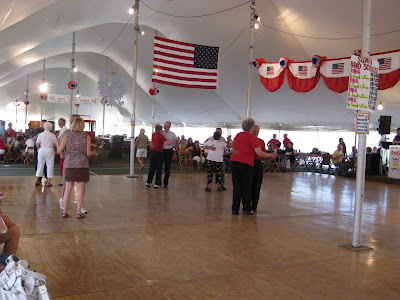 Still in a Polka-induced daze, we piled back into the car and soon crossed into Sleeping Bear Dunes National Lakeshore. It wasn’t until then that I realized I didn’t know where in the park we were going. After some scenic detouring (aka getting lost with no help from the GPS), fate again took over. “What’s that huge thing over there?” we asked simultaneously. 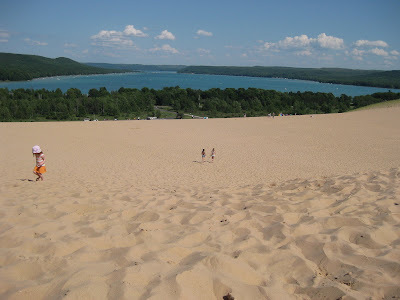 Amidst a sylvan backdrop, there appeared to be the largest, steepest sand dune ever. Just sitting there. As if it belonged. 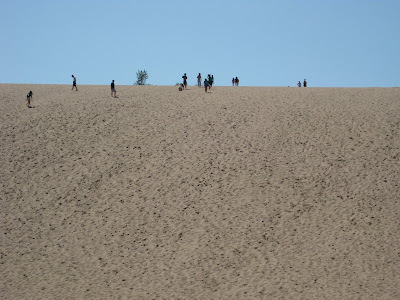 Mouths open, we turned into the “Dune Climb” parking lot, bought a $10 park pass and took our shoes off. Craning our necks to see the top, we took off, racing and sprinting like giddy children. It’s amazing what the unexpected sight of a gigantic sand dune can do to a person. About three quarters of the way up, though, reality (aka near cardiac arrest) set in. Fortunately, this gave us the chance to look back for a stunning view of Glen Lake below. Like many lakes here, it’s a light, almost Caribbean blue color. Finally, after our breathing returned to semi-normal, we made it to the crest, where if you stand on top of the right mound, you can glimpse Lake Michigan, 3.5 miles away. 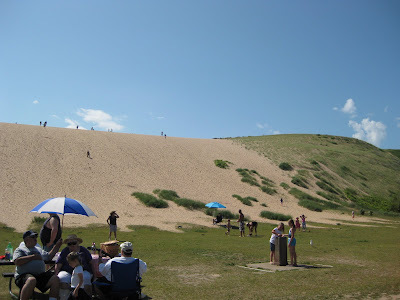 So how did this towering 110-foot sand dune (one of many in the area, some as tall as 400 feet) get here? The maddening question soon had me nose-deep in the National Park Service brochure. But alas, the answer is not simple. 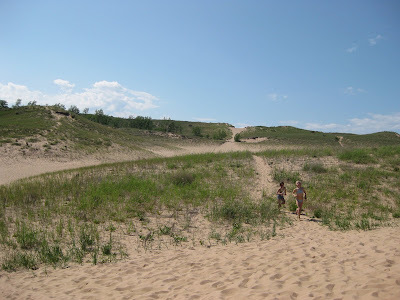 Let’s just it involves the Ice Age, glaciers, receding waters, sediment, “perched dunes” (like this one) versus “beach dunes,” strong westerly winds, dune migration, “ghost forests” and more. In other words, I still don’t get it. But even that can’t take away the awe of stumbling across two very different wonders in one perfect afternoon.